My wife and I have become avid? gardeners. However, we prefer to use the Square Foot Gardening technique. I just screw together some boxes, mix up the soil, and away we go. It takes up very little space, and gives us tons of veggies. Also, being solidly in Zone 4 (as much as I try to convince myself we are in zone 5, it just is not so) having raised beds lets us get our garden in faster. But, we have this problem in that our house has terrific southern exposure, but no windows on that side of the house. We have tried starting seeds on a bay window in our living room, but we just don’t get enough light. My wife was looking at some seed starting benches, where you can move a light up as the seedlings grow, but they were very expensive for the final product. So, we decided to make one ourselves. The plan was it had to be cheap and collapsible, since we were only going to use this a few months out of the year. Our biggest constraint was the light. Home Depot had a 48 inch shoplight on sale for under 10 dollars, and it would fit indoor plant lights, so that was our basis for our size. I also wanted to make this, that if we wished, we could put a second bench down below to double our seed starting capacity. Once I had the width down, the rest fell into place. 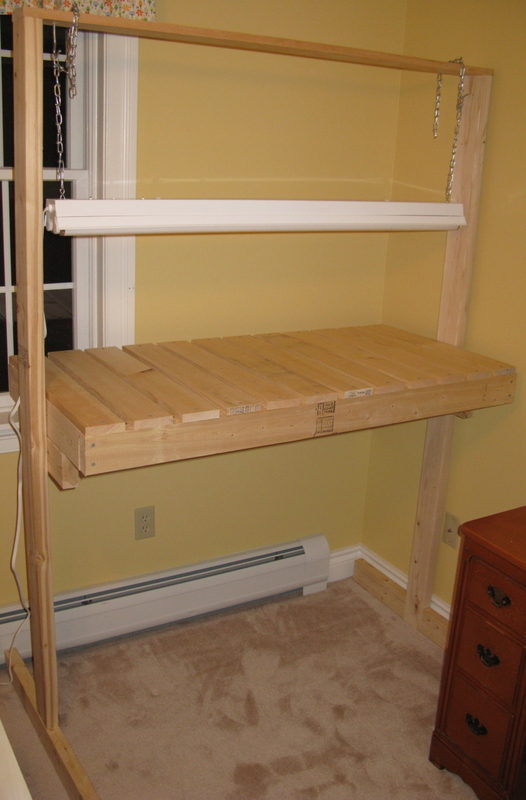 The whole thing was made out of five 2x4x8 studs from Home Depot at under $3 each, and three 1x4x8 foot boards from the top of the bench. I bought two hooks and some chain at Home Depot to support the light, and let us easily adjust the height. To make sure this was easy to take down and put away for storage, I used a 3/4 inch dowel, and using a 3/4 inch drill Forstner bit, I cut the holes into which the dowels would seat. The bench itself is 50 inches by 24 inches with 1×4 boards cut and screwed into place to form the platform to hold the seed trays. The support stands are 6 feet tall, with the support for the bench anchored in using 3 inch deck screws at a 36 inch height. 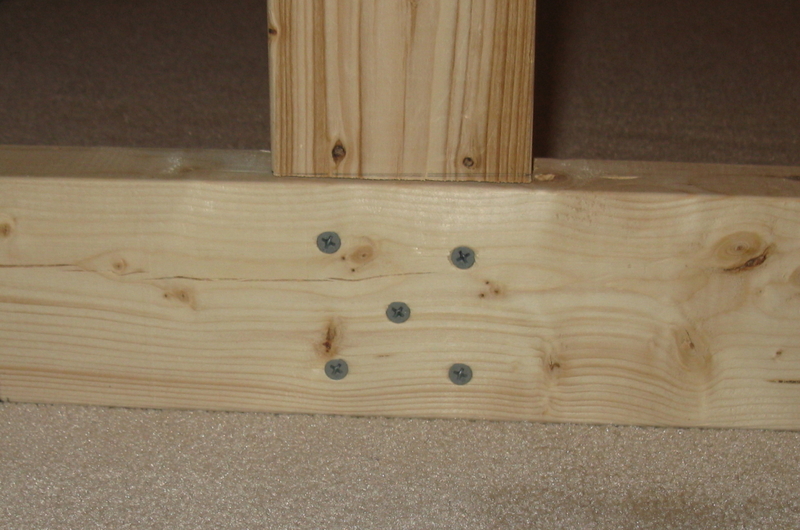 The base of the stand is just a 28 inch piece of 2×4 stud lapped onto the base of the stand and held in place with 1 1/4 inch screws. 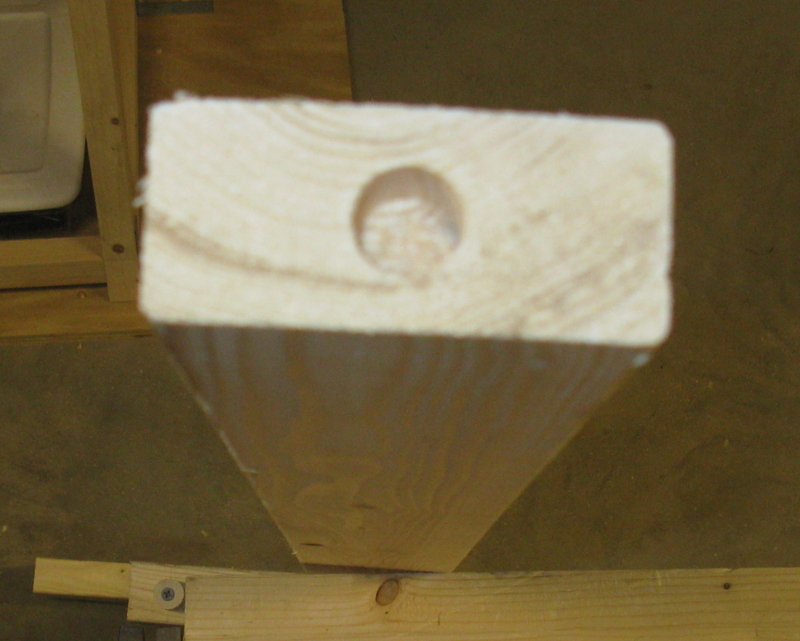 The top of the stand has holes drilled to receive the dowel pieces attached to the cross piece that supports the light. 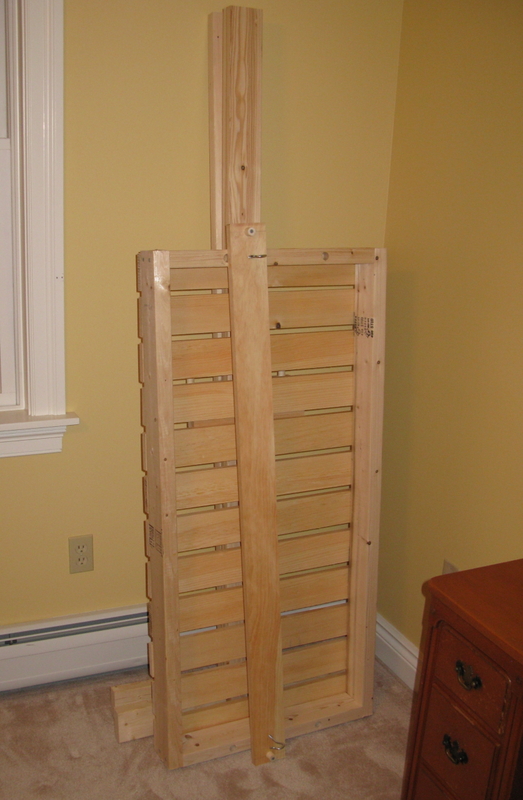 The whole thing can be put up or taken down just by fitting the round pegs into the round holes, and then collapsed back down in easier to store pieces. It will spend most of the year in our attic, waiting for the next spring. So, this weekend, we will start our seeds, first up, leeks!